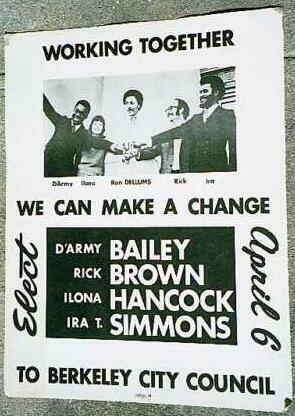 The April Coalition slate of D'Army Bailey, Rick Brown, Loni Hancock and Ira Simmons, was joined by their major endorser, Congressman Ron Dellums, in this influental 1971 poster. Voters were led to believe it was a real team who would work together. This is what April Coalition people hoped for. In reality, the slate almost self-destructed before the election. The Berkeley Black Caucus had picked the unknown Bailey and Simmons to run with the April Coalition. That choice turned out to be a disaster. Once in office, D'Army Bailey's race-based politics and hostile tactics made it impossible for Loni Hancock to work with him. Bailey was recalled in August 1973 by the conservatives.